With more people having dogs nowadays, there’s an increasing demand for pet care in the US. Owners are now willing to pay for people like you to look after their pets while they are away. If you like to be part of this growing trend, then this article on how to make money with Rover may be a good fit for you. Rover is basically a marketplace for pet owners to search and contact individuals who provide specific pet care services within a certain time period around their areas. The tasks that are in demand usually involve dog boarding or doggy day care in the sitter’s home, house sitting in the owner’s home, drop-in visits for 30 minutes and dog walking for 30 minutes. While a professional qualification isn’t required, one needs to be at least 18 years old and free from any criminal backgrounds in order to sign up. It’s also important to have caring and responsible traits when performing such services as it reflects your reputation as well as your income potential. Becoming a Rover means you get to spend a lot of time with pets and for some people, it can be an enjoyable work. You get to do a lot of exercises as well as building your social network during your free time. The payment is done entirely online so there’s no hassle in handling any cash transfer. The nature of the job can be quite seasonal that peaks mostly during holiday seasons. Therefore it may not be a good idea to rely on it as a main source of income. When dog-sitting in your own home, you need to consider preparing your home or anticipate unavoidable damages that could happen with pet interactions. Often times, the mismatch of the dog and the owner’s personalities can lead to a lot of misunderstanding/dispute during or after the service, so that’s something you would want to avoid as much as possible. If you are aware of all these and still decide to give it a go, this is how it works. To get started, you can create a profile to give clients some ideas about yourself and the home environment you live in. You can also introduce your own pets, mentioned additional skills and show the dates that you’ll be available. As an independent contractor, you are free to set your own rates based on what other sitters are charging within the area. Rover generally recommends at least $30 for overnight services, $15 for walks and drop-in visits and $20 for daycare. People who take on this job full-time can make a minimum about $800 to $900 per month and those with more experiences and better ratings can command for higher fees. Once the profile is reviewed and approved, you’ll be able go live and can start accepting requests. When contacted, sitters are encouraged to set up a Meet and Greet session to get to know the owners and dogs better before committing to a booking. Owner will pay for your service through Rover in which the company takes 20% of the earnings and you get to keep the remaining 80%. Rover takes a cut because it allows you to list your services on the platform for free and they also use this profit sharing to cover for insurance during booked stays, emergency support, advertising and building new features on the site. After completing a service, the funds will become available within 2 days and can be redeemed via PayPal or check. Getting noticed in the marketplace can be quite challenging because there are many sitters posting for availability at any given time or location. Hence, it’s important to initiate promotions in order to grow your clientele and Rover has provided some tools just for these purposes. One of the most popular traditional marketing tools is to use business cards and this can be customized and purchased through the official store. Placing them in shelter homes, pet shops or the veterinary clinics can help to attract new customers. Interestingly, the company also provides materials like lawn signs, car magnets and window stickers to increase exposure within your local community. While these items are nice to have, they are often overlooked by the public or simply thrown into the bin. 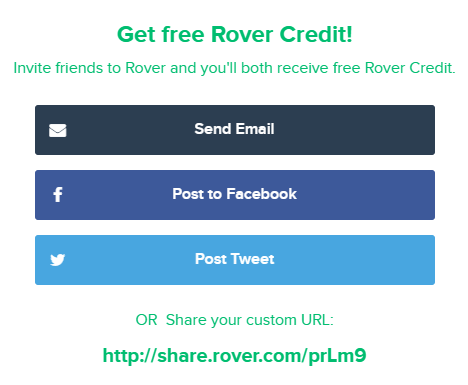 A more cost-effective method is to promote online using the unique referral code that has been created for you by Rover. The advantage of such link is that you can reach a wider audience who has no access to your business cards AND it allows you to earn more. When someone follows your link – either through Facebook, Twitter, YouTube videos or email – and create a Rover account for the first time, they’ll get $20 off their first booking as a pet parent and you’ll get a $20 credit. If they joined as a pet sitter or dog walker, you’ll make $50 credit. These are great additional cash to have besides providing the actual dog sitting service, so who doesn’t like that, right? In fact, there’s a better way to leverage from the link which isn’t mentioned on the site. If you owned a blog, you can promote through articles and this content, when optimized, can reach out to an even wider audience size. By attracting visitors through this manner, you make your services stand out among other dog sitters and become less dependent on Rover to show your listing on the competitive marketplace. Another advantage of having a blog is that you can provide helpful information for people who are searching for pet care tips, dog sitting services or even guide others on how to become a successful dog sitter through your own experience. Since you are running an independent business, you could also partner with pet products affiliate programs to monetize from your blog content. This allows you to generate continuous income even during the low seasons. If you haven’t got a blog, the first thing that’s needed is to get a custom domain and connect to a WordPress platform. There are plenty of themes that you can choose from WordPress and it can be customized in a variety of ways to suit your needs. With relevant content, promoting your services through social media becomes more personalized and less commercialized for the readers. If you haven’t had any experience with WordPress before, here’s a chance to use it for free. Simply enter a desired blog name below and test it out yourself. Ready to Become a Dog Sitter? Then I hope this overview has given you a good idea of the market opportunity and how you can make money with Rover using various creative methods that I’ve just mentioned. Many people treat dog-sitting or walking as a part-time job, but I like to think that with strategic planning, it’s not impossible to turn it into a full-time business. If you have this vision in mind, then it would be best to check out my recommended training platform for more guided tutorials about online marketing. Let me know if you have any questions or comments below and I would be more than happy to assist. I have experience with Rover as a pet sitter. We started providing services a couple of years ago and had a very steady stream of regular clients. It kept us busy all the time and we absolutely loved it. However, things changed when we decided to take a long vacation. Now that we are back in business, we haven´t been getting many requests from new clients. I was shocked to find out that other sitters were charging half of the suggested Rover´s rates. So, I had to cut my prices too. I´m all for competition, but this is too much. There doesn’t seem to be any logic for these lower prices. I like doing this both for fun and as a business, but I am seriously considering quitting. Thanks for introducing me to the details of this service. I have friends who are interested in working at home and would like the opportunity to work with pets and get outside away from the desk too. Often times, I wondered how pet sitters would get noticed. They are getting business cards and promotional help from Rover, but it would be even better if they have a blog. The link they get from the program would have 24/7 impact, so even having a free website would help someone get started with their pet sitting business. One question though – where can people research about the seasonality of dog sitting in their area? Hi Chas, one tool you can use to do that research is Google Trends because it will highlight popular locations for a selected keyphrase. Alternatively, you can also try Google Keyword Planner as it will also show popular keywords for a targeted area. Rover seems like a legitimate service. I like the fact that they don’t have a high requirement, but still run through profile checks before allowing someone to be a pet handler. I will recommend this program to a friend who is interested in walking pets. Thanks for the review. Hi Cathy – thanks for sharing this information on how to make money with Rover. It’s funny because I have heard of Rover and have considered using this service for my own dog while I’ve been away. But, I never considered taking advantage of this service as a money maker for myself. Pet owners are forever struggling with who will look after their pets when they go away. So having a service like Rover sounds like a great idea. For those who plan to make money with it, I can see why it would be seasonal. I’m guessing winter would be a slower month for rover workers? I think this service would be great for people who don’t want the commitment of owning pets also. You can look after a dog for a week or so and then return it while making a little extra cash on the side. Very suitable for people with flexible work schedule. I might even give this service a try someday. This is a really good overview of a unique way to make money. I agree that having your own site would be key to starting up and actually being successful with it. I had heard of people doing dog walking and sitting as a side business, but had never heard of Rover as a hub to getting yourself noticed. Thanks for opening my eyes to this new opportunity. I had no idea Rover had so many incentives for getting started. I’m glad you cleared up what Rover is exactly. When I looked into it, it seemed that people in my area were mainly looking to have their pet stay at my home, but I was looking to take care of the pet in the owners home. I’ll have to check into it again and share this info with my brother too. He’s a natural when it comes to taking care of pets. Thanks! This sounds like a great way to make money if you are a pet enthusiast person. Just wondering, are there many issues with people having disputes with this type of service being delivered? I’m UK based – is it open to people over here or is just for the United States at present? Any gig based type of service will have their fare share of disputes which you can easily find online. That’s because they are merely online marketplaces for people to post/request for jobs and there’s limitation to how much they can control/screen for potential troubles. As an independent contractor, you are also not fully protected by the labor law so there will certainly be disputes from both parties in the case of unfavorable situations. Rover.com is currently available only in the US. If you are based in the UK, you may want to check out the Trusted House Sitter program or any other organization that’s specific to that region. After reading this review about Rover, I found it very innovative in making money online. I don’t live in the USA – if that was the case, I would have started this online business right away. Many people have pets and need people to take care. By using the internet, the market could be big enough to get heavy checks which is the dream for many of us who are pet lovers. Thanks so much for this article. Rover seems like an awesome side hustle to make some extra income. I love animals which like you said, would make this a very enjoyable job for me. I don’t really mind the fact that the popularity of the jobs are seasonal as long as I just use it in my free time. Something I would think about doing next summer.